^ Almaany Team. معنى كلمة شَهْباءُ في معجم المعاني الجامع والمعجم الوسيط - معجم عربي عربي - صفحة 1. almaany.com. ^ 3.0 3.1 eAleppo:Aleppo city major plans throughout the history （阿拉伯语）. ^ 4.0 4.1 Aleppo City official web Population facts 互联网档案馆的存檔，存档日期2011-09-03. ^ UN Data, Syrian Arab republic. Data.un.org. 1945-10-24 [2012-03-11]. ^ Sarina Roffé. The Jews of Aleppo. The Jewishgen. [2016-12-03]. （原始内容存档于2016-12-12）. ^ حلب الشهباء..معناهاوأهميتها عند النبي العربي إبراهيم الخليل. hadhramautnews.net. ^ Willelmus Tyrensis. Historia rerum in partibus transmarinis gestarum, 12:9. ^ alfonso archi. Orientalia: Vol. 63. : 250. ^ Paolo Matthiae; Licia Romano. 6 ICAANE. : 482. ^ Trevor Bryce. 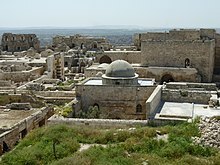 Ancient Syria: A Three Thousand Year History. : 111. ^ Paolo Matthiae; Nicoló Marchetti. Ebla and its Landscape: Early State Formation in the Ancient Near East. : 250. ^ Horowitz, Wayne. Mesopotamian Cosmic Geography. Eisenbrauns. 1998 [29 August 2013]. ISBN 0-931464-99-4. ^ Cyrus Herzl Gordon; Gary Rendsburg; Nathan H. Winter. Eblaitica: Essays on the Ebla Archives and Eblaite Language, Volume 4. : 63,64,65,66. ^ Trevor Bryce. 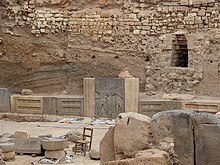 Ancient Syria: A Three Thousand Year History. : 34. ^ Trevor Bryce. The Kingdom of the Hittites. : 152. ^ Lipinsky, Edward. The Aramaeans: Their Ancient History, Culture, Religion Peeters, 2000: 195. ^ Kipfer, Barbara Ann. Encyclopedic Dictionary of Archaeology. 2000 626. ^ Ancient Villages of Northern Syria. UNESCO. [2016-08-11]. ^ Walter Emil Kaegi. Heraclius: Emperor of Byzantium. Cambridge University Press. 2003: 74. ISBN 0-521-81459-6. ^ A.I. Akram. The Sword of Allah: Khalid bin al-Waleed, His Life and Campaigns. Rawalpindi: Nat. Publishing House. 1970. ISBN 071010104X. ^ Bikhazi, Ramzi J. The Hamdanid Dynasty of Mesopotamia and North Syria 254–404/868–1014. Ann Arbor: University of Michigan. 1981. ^ Bianquis, Thierry. Mirdas. The Encyclopedia of Islam, New Edition, Volume VII: Mif–Naz. Leiden and New York: BRILL: 115–123. 1993. ISBN 90-04-09419-9. ^ David Ayalon, Eunuchs, Caliphs and Sultans: A Study in Power Relationships, (Hebrew University Magnes Press, 1999), 166. ^ Encyclopedia Britannica online. [2011-10-19]. ^ Runciman, A history of crusaders, 1995: 314. ^ Alan Taylor. Aleppo Before the War. the Atlantic. 2016-12-21 [2017-01-15]. ^ 41.0 41.1 41.2 41.3 41.4 41.5 Gábor Ágoston; Bruce Masters. Encyclopedia of the Ottoman Empire. New York: Facts On File, Inc. : 30–32. ISBN 0-8160-6259-5. ^ Aleppo in History. Panoramaline.com. [11 March 2012]. （原始内容存档于15 March 2012）. ^ Jasanoff, Maya. Pashas: Traders and Travellers in the Islamic World by James Mather. The Guardian. 5 December 2009. ^ James Mather. Pashas: Traders and Travellers in the Islamic World. Yale University Press. 2009. ISBN 9780300170917. ^ 46.0 46.1 Profile: Aleppo, Syria's second city. BBC. 2016-09-22 [2016-11-20]. ^ David W. Lesch. Gamal Abd al-Nasser and an Example of Diplomatic Acumen. Middle Eastern Studies. 1995, 31 (2): 362–374. ^ Alexander Russell. The Natural History of Aleppo 1st. London: Unknown. 1856: 1-4. ^ 50.0 50.1 Alexander Russell. The Natural History of Aleppo 1st. London: Unknown. 1856: 48-58. ^ Alexander Russel. The natural of Aleppo . London. 1856: 17. ^ 52.0 52.1 Syria needs analysis project. ALEPPO – Governorate profile. [2016-11-30]. （原始内容存档于2013-06-25）. ^ Peregrine, Peter Neal; Ember, Melvin; inc, Human Relations Area Files,. Encyclopedia of Prehistory: South and Southwest Asia. Springer. 2002: 42 [30 September 2011]. ISBN 978-0-306-46262-7. ^ Gren, Erik. Orientalia Suecana. Almquist & Wiksell Periodical Co. 2002: 37 [30 September 2011]. ^ Alexander Russell. The Natural History of Aleppo 1st. London: Unknown. 1856: 12-14. ^ WMO. Homs, Syrian Arab Republic. [2016-11-30]. ^ World Weather Information Service – Aleppo. World Meteorological Organization. [10 November 2012]. ^ Climatological Information for Aleppo, Syria. Hong Kong Observatory. [10 November 2012]. ^ Average Conditions Aleppo, Syria. BBC Weather. [10 November 2012]. ^ 200,000 civilians try to escape violence in Syrian city of Aleppo. ^ The Virtual Museum of Armenian Diaspora. Ministry of Diaspora of the Republic of Armenia. [2014-02-19]. （原始内容存档于2014-02-19）. ^ Syria Central Bureau of Statistics. توزع المشتغلين(15 سنة فأكثر) حسب أقسام النشاط الإقتصادي الرئيسي والمحافظات والجنس ( حضر - ريف ). [2016-12-03]. ^ 75.0 75.1 75.2 75.3 75.4 75.5 75.6 Aleppo Urban Development Project. Report on Local Economic Development in Aleppo (PDF). 2010 [2016-12-03]. ^ 76.0 76.1 Syrian Economic Forum. Economics of Aleppo (PDF). 2015 [2016-12-03]. ^ 155 billion Syrian Pounds invested in Aleppo Industrial City. Aksalser.com. [11 March 2012]. ^ Geoffrey D. Schad. France, Syrie et Liban, 1918-1946. Damas: Presses de l’Ifpo, Institut français d'études arabes de Damas. 2002: 291–312. ISBN 9782901315773. ^ Lysandra Ohrstrom. Syria war wreaks havoc on drug industry. The Daily Star. 2013-07-01 [2016-12-03]. ^ Abdullah Hamada. The Syrian crisis: Repercussions of the pharmaceutical industry. (PDF). Syrian Economic Forum. 2014. ^ Syrian State Bureau of Statistics. استعمالات الأراضي حسب المحافظة 2010(ألف هكتار ). [2016-12-04]. ^ Robert Fisk. Aleppo's Sheikh Najjar: The death of a once-rich city. Independent. 2014-06-06 [2016-11-03]. ^ War-ravaged Syrian industrial zone hopes for new life. Dailymail. AFP. 2014-11-20 [2016-11-03]. ^ Fehim Taştekin. Return to Aleppo: A squandered legacy. Al-Monitor. 2017-01-12 [2017-01-15]. （原始内容存档于2017-01-14）. ^ Barak Barfi. In Aleppo, I Saw Why Assad Is Winning. Politico. 2016-12-02 [2016-12-05]. ^ Nabih Bulos. Aleppo was Syria's factory floor. Now it's in ruins and business leaders wonder if it's safe to rebuild. LA Times. 2016-11-15 [2016-12-05]. ^ Crime Wave Engulfs Syria as Its Cities Reel From War. The New York Times. 2012-08-09 [2016-12-05]. ^ Younes Ahmed. Syrian factories relocating to coastal area. The Arab Weekly. 2015-06-26 [2016-12-05]. ^ Stephanie Freid. Syrian civil war forces business owners to relocate. CCTV America. 2015-01-05 [2016-12-05]. ^ Edward Dark. Aleppo's war economy. Al-Monitor. 2013-10-24 [2016-12-05]. ^ Karam Shaar. Economy (PDF). [2016-12-05]. ^ Hugh Hughes. Middle East Railways. almashriq.hiof.no. [2009-05-05]. ^ Earle, Edward Meade, Turkey, The Great Powers, and the Bagdad Railway. Russel and Russel 1966: 109-111. ^ Barry, Keith. After Decades of War, Iraq Adds Fleet of New Trains to Its Aging Railway. Wired.com. March 24, 2014 [27 September 2015]. ^ Ferenc Valoczy. CFS - Chemins de Fer Syriens. [2016-11-21]. ^ Anne Barnard. Once Bustling, Syria’s Fractured Railroad Is a Testament to Shattered Ambitions. New York Times. [2016-11-21]. Lynn Simarski, 'The lure of Aleppo" history and architecture.